Made from an unfinished doily done by the designer's great great grandmother in Denmark. This might look really cool with a really simple wedding dress. Shop The Bungalow. Via the style files. 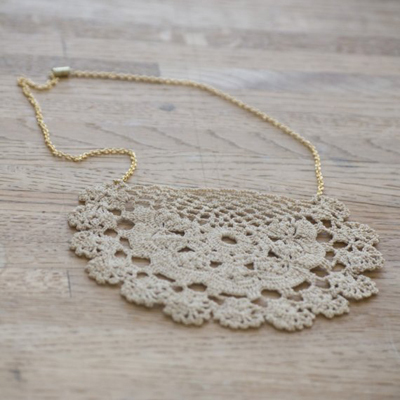 Why is it that I have no use for doilies when they are scattered around someone's house, but if you hang one on a necklace I'm drooling all over it? Now I want a doily. Aw thanks so much for featuring me!! I had never thought about putting it with a wedding dress but that would look really great!